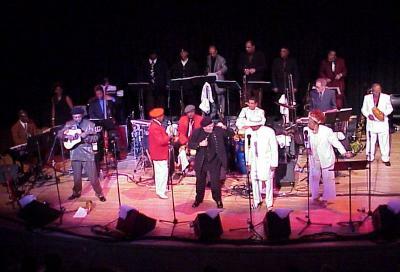 This Fan Page has links to photographs and MPG Salsa Video Clips of the Afro Cuban All Stars. The Afro Cuban All Stars are group of musicians from Cuba that play traditional music. The musical director is Juan de Marcos Gonzalez the producer of the Buena Vista Social Cub recordings. Here we have photographs of the the Afro Cuban All Stars playing in New York City at Town Hall and Remy Nightclub in 2000.